The true Cream of the Crop is a stalk of Champagne-Rhubarb, a wakefield-delicacy. You won't find this rhubarb plant in any backyard garden. This is not the everyday rhubarb that most of us are using. 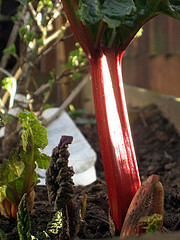 This is the rhubarb produced by growing in the forcing sheds that are especially prominent in Wakefield England. The rhubarb grows quickly in the hothouses that absolutely allow no light in whatsoever as it would spoil this delicacy. In fact, the produce is harvested painstakingly by candlelight to ensure the dim surroundings in which it grows. Can you imagine going out to your garden to pick by candlelight? I can't. Now that's dedication to producing a quality product for sure. Some recipes call for champagne-rhubarb specifically to make a great dessert like rhubarb-creme-brulee, for example. Overall, it's the tenderness, the sweetness, the recognizable color of pink and the dainty curled little yellow leaves that easily identifies this produce. This rhubarb truly is considered a delicacy and it commands at least 2 or 3 times more in price than rhubarb harvested from the outdoor gardens. Of course, you can follow a recipe using outdoor rhubarb from the many good garden varieties. Should you ever have the opportunity, seize it and bake in style with this preferred rhubarb type, a true wakefield-delicacy. This recipe uses ramekins, champagne-rhubarb is best if you have it, (if not, that's ok too) and the ability to glaze the sugar at the end. This is kind of the icing on the cake. So, make sure your oven grill is in working order, or a gas gun or mini blow-torch is commonly used. In a roasting pan, spread out the rhubarb, and cover with most of the white sugar. Sprinkle it over evenly. Cover and bake in a 350F oven for approximately a half hour until the rhubarb becomes quite tender. In a saucepan, heat the cream to boiling. Add the vanilla extract or the seeds of the vanilla pod. The pod is then thrown away. Optional - Add a spoonful of ground ginger at this point to the heated cream mixture, for some extra flavor. Remove from the heat, set aside, and let cool to a warm temperature. Separately, mix the yolks and the remainder of the white sugar. Gently whisk in the cream. Divide the rhubarb mixture into the ramekins, and top up with the cream mixture very gently, so that the cream remains on the top. Lower the oven temperature to 350F, and place the ramekins in a water bath, approximately three quarters of the way up the sides of the ramekins. Let bake for 25 minutes, and remove from the entire pan to let sit to settle and cool down. Just before you serve them, sprinkle the rhubarb-creme-brulee with a little icing sugar and either place them under your oven grill until the sugar melts and crystalizes. Or, using the gas gun or mini blow-torch, glaze the sugar a few times. This gives the dessert a gorgeous color on top and the caramel taste. 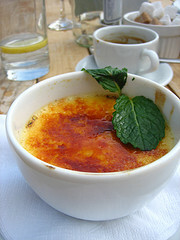 Creme-brulee is from the French, meaning "burnt cream" and that is why the glazing method is important. These desserts are a mix of eggs and cream to produce a fabulous tasting custard.